Q&A: A Green Economy Without a Pricetag on Nature? YEOSU, South Korea, May 26 2012 (IPS) - As thousands gear up for the 2012 Earth Summit, Rio+20, scheduled to kick off in Brazil on Jun. 20, questions on the viability and adequacy of a ‘green economy’ abound. Experts, activists and policy makers are divided on what is needed to solve the deadlock on carbon emissions agreements and tackle global warming. Some believe a complete paradigm shift, away from the neoliberal freemarket ideology, is necessary to turn the massive tide of climate change, while others believe a market-based approach to the crisis still has merit. 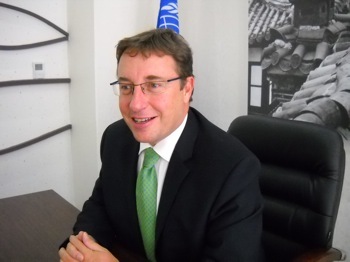 Achim Steiner, executive director of the United Nations Environment Programme (UNEP), believes a healthy mix of both frameworks will be the key to success. An environmental guru whose career quite literally grew alongside the idea of sustainable development, which came into being twenty years ago at the first Rio Earth Summit in 1992, Steiner has negotiated for years within the tumultuous arena of global environmental crises. Against the backdrop of Expo 2012, currently underway in South Korea’s port city of Yeosu, whose primary theme is the protection of the world’s oceans and marine resources in the face of rapid climate change, IPS correspondent Manipadma Jena interviewed Steiner on the various intersecting solutions to the climate crisis. Q: What, in your opinion, has been the state of the global environment since the 1992 Earth Summit? A: The balance sheet in overall terms remains a negative one. We have not managed to achieve what we set out to in 1992, which is to introduce a greater degree of sustainability into the global economy. We have more people consuming more, there is biodiversity loss, an unfolding crisis of overfishing; emissions continue to go up, the notion that we could somehow decouple resource consumption and societies’ pollution footprint has not succeeded. Still, it is not as if we are confronted with an unsolvable dilemma. We have an extraordinary array of examples of how development can be sustainable. It is not a coincidence that the scheme of the green economy in the context of sustainable development and poverty eradication has emerged on the scene. The challenge we face, wherein also lies the importance of Rio+ 20, is: how do we scale up these good lessons, because we know we can do it. Q: Would it be faster if change came from the top? A: (It would be helpful) if the top didn’t stand in the way. What we (see) today is that the architects of our economic policies are sometimes of the corporate outlook. They are very often also an obstruction or a constraint on innovation because they don’t allow green technologies to emerge or new policies to be tried out. Rio+20: The Moment When Everything Changed? Can 'Blue Forests' Mitigate Climate Change? Q: Rio+20 will likely see a discussion on expanding and strengthening UNEP’s mandate. What role do you see UNEP playing in coming years to maintain the health of oceans and livelihoods of fisher communities? A: It is critical that we address three major drivers that are currently affecting the future health of our oceans. Pollution is the first, not just land-based but also through the shipping trade. Over 75 percent of our world trade travels though the oceans. Pollution through new forms of resource exploitation, oil exploration, deep-sea drilling and deep-sea fishing are all affecting the functionality of oceans. The second issue is fishing and marine biodiversity. We are mining the very stock of protein that is available to us as a growing population to a point where fish stocks are collapsing. Governments are subsidising fisheries in the world’s oceans at 27 billion dollars a year of which we estimate that 20 billion are actually fuel subsidies. They are encouraging over-exploitation. We have to change the way we see the subsidy regime. We have to reduce industrial fishing capacity and stop illegal fishing. We have to restock and restore fish supplies, particularly for traditional fishing communities. It’s the only way in which we can achieve both the environmental objective of maintaining fish stocks and also the social objective of maintaining the livelihood of millions of fishers. Also we all must understand how protected areas can be a critical building block for nations. Marine protected areas account for less than one percent in terms of the coverage. We want to get to a point of having 10 percent coverage. Q: Critics of the Payment for Ecosystem Services (PES) scheme say monetising nature and valuating forests could be used as collateral for debts by poorer countries and eventually risk being lost to creditors. What are your views? A: Certainly the risk is there but it is diminishing as forests increasingly become a public issue and societies see forests as a national asset, economically as much as ecologically. In every society and every economy there is a temptation to exploit natural resources for short term gains. But to link the notion of payment of ecosystem services as something that might threaten forests because it could lead to the credit-collateral phenomena is like saying we should not introduce money as a way of transacting because people could use it for corruption purposes. Does such valuation equal monetisation? Not necessarily. We in most contexts today sell our labour for money. It is the way in which we transact. Why would we draw this imaginary line around ecosystem services as not being part of this reality today? Q: If the world does make a paradigm shift away from the current basis of calculating gross domestic product (GDP), what components should ideally go into estimating GDP? A: We need a more sophisticated indicator. Most people today would acknowledge that the GDP growth in itself is extremely crude and not a legitimate indicator of economic and development progress, because it does not acknowledging that a society has a natural stock of wealth, alongside the services that nature provides us. Current GDP may not disappear but it will not retain this exclusive monopoly on which a country’s economic success or failure is determined. Many governments are in fact on the verge of doing a more inclusive kind of accounting. And finally we also need to look at how economics is often being used in terms of pricing. The price of energy used to be defined as most successful when it was cheapest. Yet we know today that renewable energy technologies will increase employment by more than 30 percent compared to the current business-as-usual model. Is it not a vital consideration to pay a few more cents per kilowatt of power, when you can create jobs for these armies of unemployed youth in our societies?